The SPICS Soul platform has been developed by RISE Company (Research Industrial Systems IT Engineering) in close collaboration of Univ. Prof. Dr. Thomas Grechenig (the Head of the department Industrial Software at the Vienna University of Technology and CEO of RISE Company) and the Austrian Association for Bipolar Disorders under the lead of the specialist Univ. Prof. Dr. Christian Simhandl. Operator comprehensive studies on the treatment process of mental illnesses are nowadays very expensive and can be provided only with great effort. Thus, there is a lack of studies on long-term effectiveness and a very drastic lack of vendor-independent evaluations on the effectiveness of drugs, techniques or other forms of therapy. Well-secured web platforms under the corresponding specialists (e.g. psychiatric clinics and medical practices in the country) provide an excellent opportunity to obtain relief to this deficiency and to achieve international trend-setting insights in the medical field of bipolar disorders (mania and depression). By the newly resulting qualified amount of information in the field of bipolar disorders a valuable input to the exploration of a widespread disease is provided. Furthermore, comprehensive studies are possible in a cost-effective way, therewith for instance studies on the effectiveness or non-effectiveness of drugs are offered. A more targeted use of (really) suitable procedures / drugs should lead to a more targeted use of relevant resources in the health care. All participants the same access to the system is granted and thus a uniform pool of experts in this medical field is created. The documentation of diseases is not standardized yet and therefore completely different. 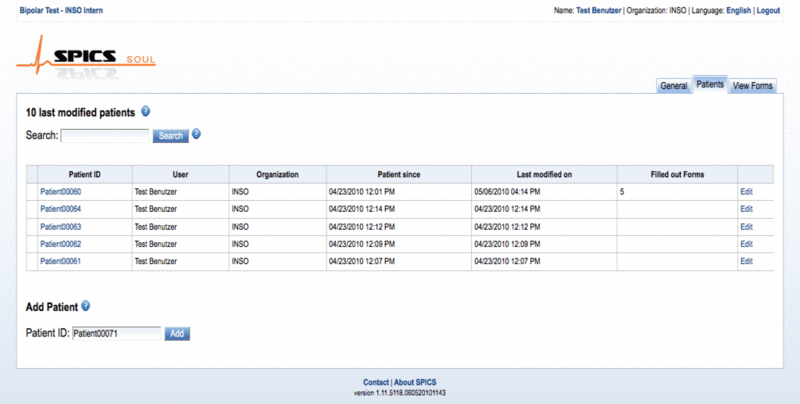 SPICS-Soul offers the unification in a semi-automated form to ensure the comparability of treatment strategies. Meanwhile not only heavy forms of mania and depression (1-2% of the Austrian general population, Austrian Dispensatory) in the hospitals but also the gentle forms (5-10% of Austrian Dispensatory) up to the bipolar spectrum (up to 25% of Austrian Dispensatory) are treated in private practices, this fact shows that a standardization is very appropriate. Currently the data of each patient in each ordination is collected, but the chronological process of individual patients or a comparison with other patients or of treatment strategies is not possible. This applies to the individual patient as well as for the doctor and hence for the entire treatment system. The greatest focus during the design and the development of the platform was set on a secure implementation according to the state-of-the-art in software engineering taking into account the Austrian as well as the European data protection regulations. This project was funded by BMVIT (Austrian Ministry for Transport, Innovation and Technology) and FFG (Austrian Research Promotion Agency, FFG) as part of the „austrian electronic network“ program.